I am having one of those days were I feel like everything is piling on top of me and I cant even think straight. Bad days, cant help but we all have them in order to make us appreciate the good days even more. Some people try to ignore my opinion, I re-edited the content of the report but they didn’t want to take it, I made it as the way it should be but they didn’t want to hear it. I am trying to keep as positive and organized as possible but you know how it feels when those moments that you cant see the end of it. We are human, bad days come and then they go, I am waiting patiently to wave this bad day goodbye. you look adroable. 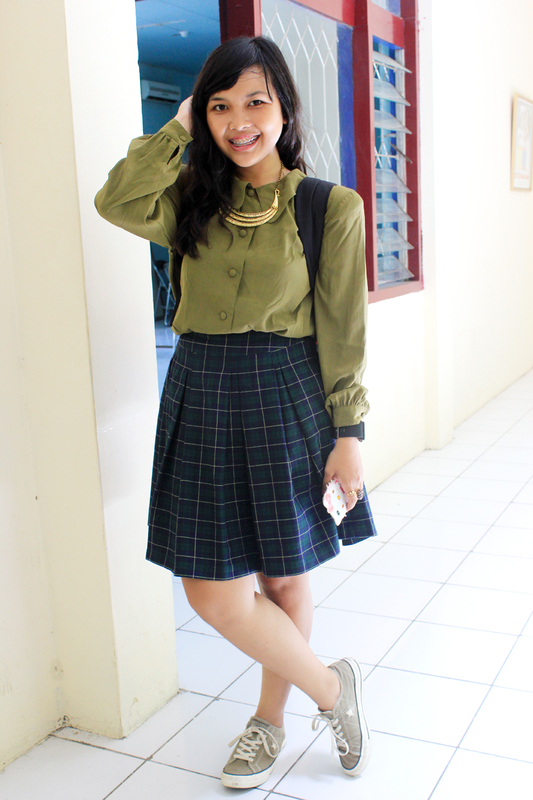 love that plaid skirt and the combination of greens. thanks for visiting my blog dear! Lovely, casual outfit! Love the combo of skirt and sneakers!